Seattle, April 12, 2018–Evidence published today on a new contraceptive option is providing one possible answer to an age-old question in family planning: how to address barriers that make it difficult for women to keep using contraception consistently. Results from a PATH study in Uganda, now published in the journal Contraception, show that self-injection of subcutaneous DMPA* (DMPA-SC, marketed as Pfizer's Sayana® Press) may help women to continue using injectable contraception longer than women who receive traditional intramuscular injections (DMPA-IM) from providers. Over the course of a 12-month study period, 81% of 561 DMPA-SC self-injection participants continued to use the product. Meanwhile, 65% of the 600 women who received DMPA-IM from a health worker continued using the product. "In many countries like Uganda, injectable contraception is widely used, but often requires women to return to clinics every three months for injections. As a result, many of them may stop using the method even if they wish to continue," says Dr. Dinah Nakiganda, Assistant Commissioner of Reproductive Health, Uganda Ministry of Health. "Self-injection of DMPA-SC is emerging as an important option for women." DMPA-SC is an all-in-one injectable contraceptive that puts control of women's reproductive health in their hands. While DMPA-IM is injected into the muscle by a skilled health worker, DMPA-SC combines the drug and needle in the PATH-developed BD Uniject™ injection system–a small, prefilled, autodisable device that is easy for providers with minimal training and for women themselves to administer via self-injection. The branded product Sayana Press is approved for use in more than 40 countries around the world. In the study, 1,161 women seeking injectable contraception at health facilities were offered the choice of self-injecting DMPA-SC or receiving an injection of DMPA-IM from a health worker. Those who chose self-injection were trained, then given three units to take home along with an instruction guide and reinjection calendar. At the end of 12 months, significantly more women who self-injected DMPA-SC continued to use the product compared to those who returned to a facility every three months to receive DMPA-IM from a health worker. Analysis controlling for multiple factors revealed that self-injection reduced the risk of discontinuing by 46%. While younger women exhibited a higher risk of discontinuation in general, self-injection appeared to help them continue: those ages 18 to 24 who were self-injecting had a 40% reduced risk of discontinuing, compared with a 25% reduced risk for those 25 and older. This is a noteworthy finding given that young women tend to have high rates of contraceptive discontinuation. "Women and girls have the ability and the right to manage their own sexual and reproductive health needs, and contraceptive self-injection is one new way to make this possible," says Martha Brady, PATH's Reproductive Health Program Leader. "Supporting them to have greater control and decision-making through evidence-based 'self-care' approaches like this can benefit not only women and girls themselves, but health systems overall." Based on these promising research results, and national regulatory approval of self-injection issued in 2017, self-injection is now available in four districts of Uganda outside of a research setting. The country is working on plans for national rollout of the practice, building on the scale-up of DMPA-SC injections from health workers, which is already in process. As Dr. Nakiganda describes, "Our vision for Uganda: any woman can go to any service delivery site to receive quality information about a range of contraceptive methods. And self-injection will be one of them." This research was supported by the Bill & Melinda Gates Foundation and the Children's Investment Fund Foundation. 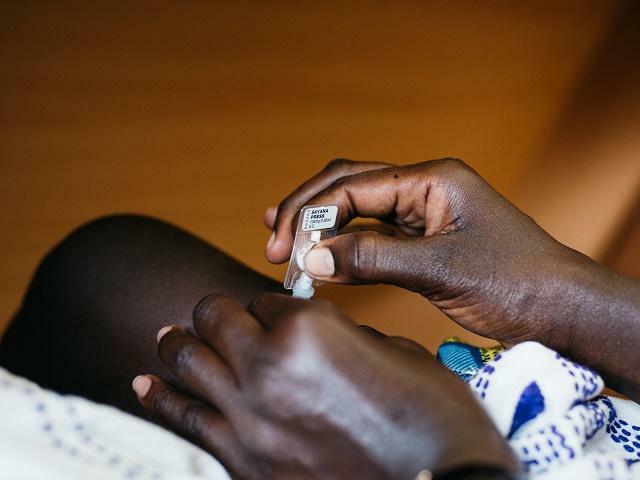 The Uganda study results align with recent research from FHI 360 in Malawi and Planned Parenthood in the United States, both of which found higher continuation for women who self-injected relative to those who received DMPA injections from a health worker. A similar PATH study in Senegal was just completed and those results will be available later in 2018. Sayana Press is a registered trademark of Pfizer Inc. Uniject is a trademark of BD. PATH is a leader in global health innovation. An international nonprofit organization, PATH saves lives and improves health, especially among women and children. PATH accelerates innovation across five platforms–vaccines, drugs, diagnostics, devices, and system and service innovations–that harness our entrepreneurial insight, scientific and public health expertise, and passion for health equity. By mobilizing partners around the world, PATH takes innovation to scale, working alongside countries primarily in Africa and Asia to tackle their greatest health needs. With these key partners, PATH delivers measurable results that disrupt the cycle of poor health. Learn more at http://www.path.org.